I told you this weekend that we had solid reasons to be excited for Wrestlemania 35. I was pumped for the show, and I was confident it would turn out to be the best ‘Mania in several years. Now that it’s in the books, let’s see how it fared by examining what WWE got right… and what they did wrong. RIGHT: So many fan-friendly results! For a company that seems to take great pleasure in trolling the fans on occasion–and sometimes goes off-the-wall unpredictable seemingly just to do so–WWE went almost all-in on trying to please the fans at Wrestlemania this year. I’m going to get into many of these wins individually, but it’s nice to see that sometimes things actually pay off, and we don’t always have to sit through stuff designed to bait us. Thanks, Vince! WRONG: Oh my god, this show is too long! And not just from a basic viewership standpoint, but also for those in attendance, as the long runtime screwed over many fans. Ouch. But aside from that, yeah, this was an endurance test just to watch. Put it this way: it was the length of two-and-a-half Avengers: Endgames! Becky Lynch is arguably the hottest act in the company, but by the time the main event started (over SEVEN HOURS after the start of the Pre-Show), the fans were too tired to muster up as much noise as you would think. There were some pops and cheers for Becky, but compare them to where the fans were earlier in the night, and it was heavily subdued. RIGHT: Joe kills Rey dead! On a night full of great results, this one actually sticks out to me first. 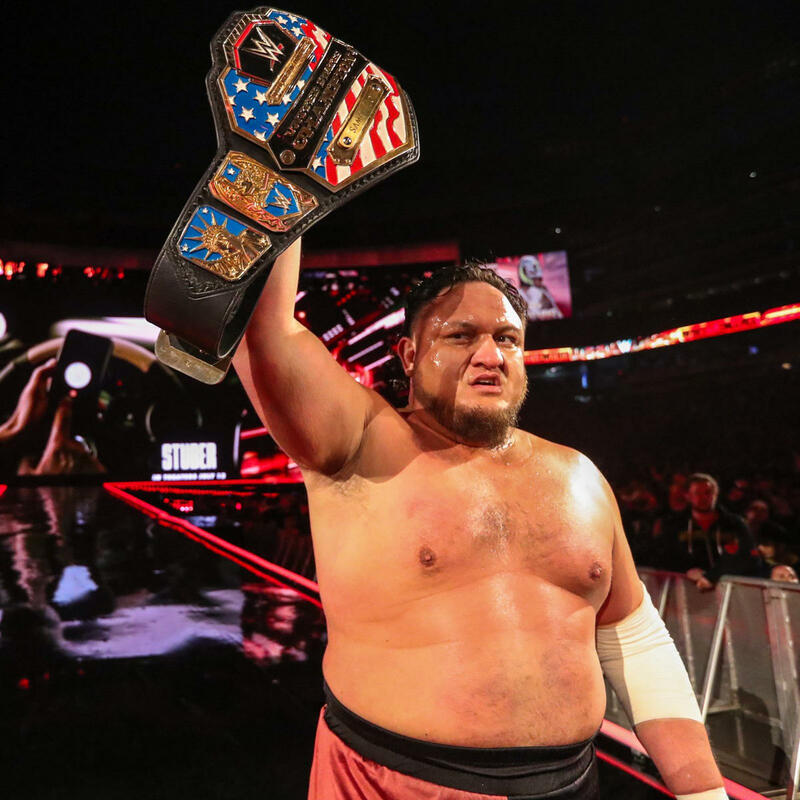 Samoa Joe has, for far too long, been booked as an afterthought by WWE. We’re constantly told how scary and dominant he is, but he always ends up looking like a loser. Not at Wrestlemania! Joe dismantled Rey Mysterio in a quick affair to retain his United States title. THIS is the Joe I hope we get going forward; he’s no youngster, but he really is about as complete of a performer as anyone else. WRONG: Too many multi-person matches! For transparency’s sake: I typically like multi-person affairs. They can be chaotic and the false finishes are dynamic and there is an added layer to everything. Wrestlemania really went overboard this year, though, as there were two (2) Battle Royals, two (2) four team tag title matches, and a triple threat main event. So many wrestlers! I’m all about giving talent their big Wrestlemania paycheck, but… did Rusev and Nakamura REALLY need to be in the Smackdown tag title match? Did Natalya & Beth Phoenix, or Nia & Tamina, REALLY need to be in the Women’s tag title match? Would it have been so hard to give us Becky vs Ronda without shoe-horning in Charlotte? Can we just get rid of the pointless Andre The Giant Memorial Battle Royal now? It’s the law of diminishing returns; when you keep filling the ring with 20 people, the spectacle of doing so lessens every time… especially in one night! Sometimes if you tell the right story, you deliver the best match–and the best moment–of the night. I actually thought Kofi vs Daniel Bryan for the WWE Title was a bit sloppy and disjointed at times, but you know what? Who bloody cares? The fluidity might not have always been there, but the intensity was. 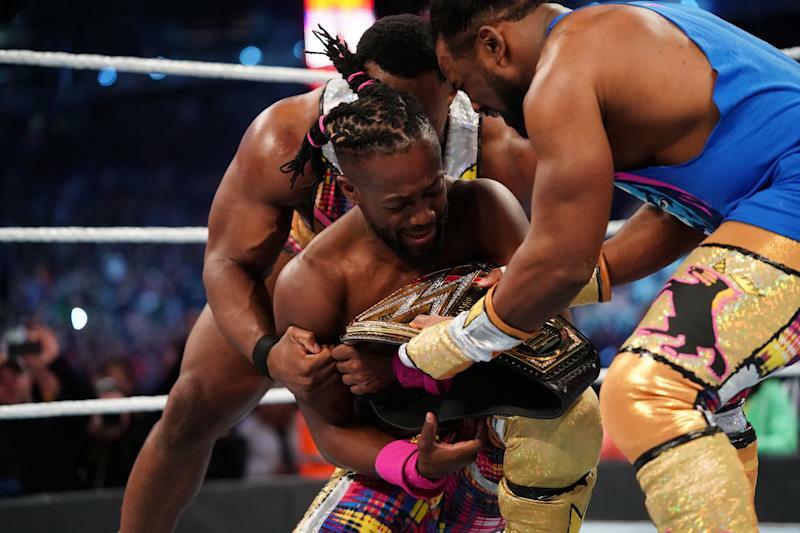 The crowd was solar hot for virtually everything they did, and Kofi, along with his sons and his brothers in the New Day, had the celebration they deserved. Perfect, perfect, perfect. WRONG: Not switching Corbin out! I’m not going to say Kurt Angle losing his last match itself was a wrong. There’s a lot of sentiment that a retiring superstar should go out on their back, and I’m fine with that. But I do disagree with giving Corbin the rub for sending him out. Baron already has as much heat as he is going to get and is never going to be accepted, so who benefits from this? Why not put Chad Gable here? Or someone from NXT like Adam Cole–could you imagine Cole if he retired Angle? He’d be beautifully insufferable. Or, hell, just give us all a huge middle finger and have Roman do it. But Corbin? Meh. RIGHT: Becky does what we all wanted her to! Wrestlemania ended with Becky Lynch holding high both the Raw and Smackdown women’s titles. And while it’s not all good–the previously mentioned lack of crowd energy, the ending that I’ll get to in a second, and the match itself just feeling OKAY–this is, again, all about the story. Becky built herself up from a complete afterthought a year ago, to the star of the show on this night. She’s the hottest act in the company, and having her lose here would have been akin to having Stone Cold not win the title at Wrestlemania 14. Just keep letting Becky be Becky, and WWE will be in fine hands. Was it to progress a story? Was it a botch? I really have no idea and am garbage at speculating on these things (be assured that if I tell you I think it is something, it is actually something else). Whatever it was, it was an ambivalent finish in a match that the crowd was already struggling to get hot for. I mean, bully for Becky winning either way, but boy, it would have been nice for a definitive ending here. Hopefully this builds to another Triple Threat since Ronda and Charlotte both have reason to believe they didn’t “really” lose. Because the IIconics are wonderful, and nuts to you if you don’t agree! I feel like I keep coming back to the length of the show and its effect on the crowd, but I thought the reaction to Finn Balor winning the Intercontinental Title (which gets a mini-Right for being another correct call on a night full of them) was a bit muted since it went on so late and everyone knew he was coming out as The Demon. While everyone would have seen it coming even if they hadn’t announced it in advance, it still would have popped the audience more if it had been a surprise. It’s just a little Wrong, though. Right guy still won, and he won relatively quickly and looked unstoppable doing it. RIGHT: The Smackdown Tag Title scene continues to be a blast! Sure, I mentioned above that this was yet another multi-person match that maybe didn’t need to be. Sure, it would have been better if it was just The Usos vs Black & Ricochet and it had 15 minutes. But it was still easily one of the two of three best matches of the night in terms of quality. All four teams are stellar performers, and they all went full fury for ten minutes. Some great spots, frantic energy, and The Usos get a main card victory for their resume. WRONG: Why doesn’t Triple-H have better matches? I mean… Batista vs Hunter wasn’t abhorrent or anything. But it was just so damn goofy, and I had a hard time taking it seriously. It might have been the most fun match of the night to watch with Andy and (future Ghosts of the Stratosphere podcast guest!) Rob Josebeck, but that’s not because it was a great wrestling contest. From the silly “OH MY GOD, NOW HIS FINGERS ARE BROKEN” spot to Dave just continually thwarting himself by trying to use stairs, it was all just… fun, but not good. Does that make sense? Oh my god, this was the Venom Movie of WWE matches! RIGHT: Seth Rollins beating Brock! I really didn’t think this was going to happen, but it did, and I am happy! RIGHT: Word Life John Cena! I don’t know why we needed two consecutive Wrestlemania with Elias/Cena segments, but who cares? This was a fun throwback for a legend in his twilight! RIGHT: No Undertaker! Taker hasn’t had a GOOD Wrestlemania match since WM29! It’s weird that this era is over, but honestly? It’s felt over for years at this point! RIGHT: Both AJ Styles vs Randy Orton and The Miz vs Shane McMahon! They were each matches that were pretty darn good without being truly GREAT! That’s not a knock on them, though, and I enjoyed both encounters! RIGHT: The Pre-Show! Murphy vs Nese hopefully moves Murphy to Raw or Smackdown! The Raw Tag Title match had emotion and energy and was surprisingly good! The Women’s Battle Royal allowed a lot of talent to shine and had an acceptable winner! The Andre The Giant Battle Royal is something I won’t mention here because it hurts my narrative! Whew! Lightning rounds are draining! So yeah, as you can see, I think WWE had a lot more positives on this evening than negatives. It’s easily the best Wrestlemania since at least 30 or 31! Spot of the night: Watching Stew fish a cat out from behind the dryer at his house. Talk about acrobatics!